Even when there isn’t an ongoing garbage strike in Jerusalem, it often seems like the streets are strewn with litter. Having identified this problem, several Pardes students took the initiative to reverse the blight. Our philosophy was that since trash on the ground often encourages further littering, we needed to nip the problem in the bud by completely clearing sites that routinely served as illegal dumping grounds. 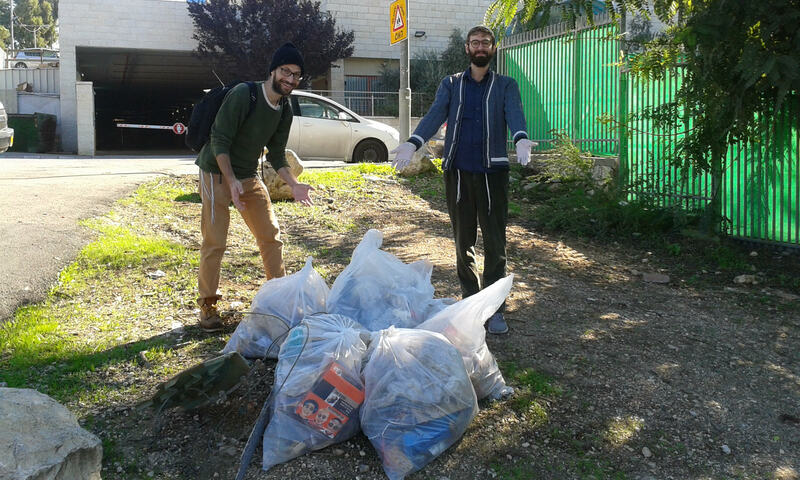 Armed with plastic bags, sanitary gloves, and a positive attitude, we clean-sweeped several parks and vacant lots in Talpiyot near Pardes. During these cleaning days, we would often remove ten or more large bags of trash from the ground. The impact was immediately apparent. Within a single hour, a spoiled lot could be converted into a pristine public space. Sometimes, however, we were disappointed to return a few days later to discover that fresh garbage had begun to accumulate on areas that we had cleaned. To be honest, this was very disheartening. If we are to merit custodianship of this land, we must treat it with the dignity and respect it deserves. In order to achieve this, everyone must assume responsibility for their part, and not rely on the collective to pick-up the slack!